This book was my attempt to delve back into the world of sci-fi. It's been a long time since I read sci-fi and I really wanted to get back into it. I'm glad I chose this book for that. 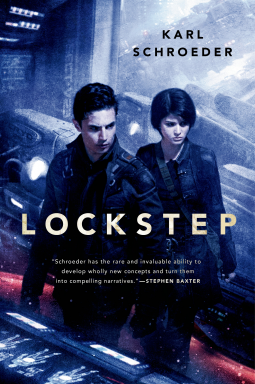 Lockstep is one of those rare, imaginative books that takes a bold look at the future and proposes what could be. It does so in a unique way that is all its own with fresh ideas that make you sit up and think, and you know how much I love a book that makes me think! There is much more to this novel than just hard sci-fi though, so don't give up on it if that kind of thing deters you. Many faceted characters, fascinating creatures, and almost steampunk-like innovations give this novel great depth. I would recommend it for fans of forward-thinking books and great science fiction, and for fans of Alex Cavanaugh and Frank Herbert.